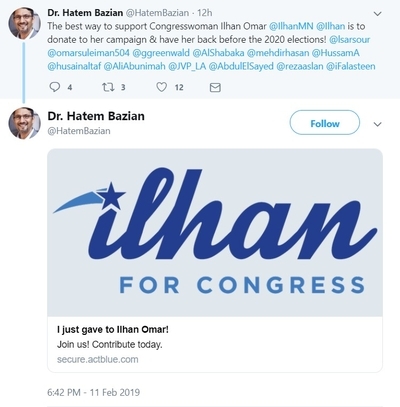 As the freshman U.S. representative was called out by her own Democratic Party leadership for anti-Semitic tweets implying Jewish money controls the Congress she now sits in, ideological allies took to social media encouraging people to donate to Omar's 2020 campaign. They linked to a fundraising page hosted by Act Blue, a self described "nonprofit, building fundraising technology for the left." Zahra Billoo, director of the Council on American-Islamic Relations (CAIR) San Francisco chapter, said she made a donation to Omar's re-election campaign Monday and urged followers to do the same. "Tweets to support her are important," Billoo wrote, "but let's also ensure she can keep on doing the important work she's doing." Billoo has a well documented blind hate toward the Jewish state, comparing its soldiers to ISIS terrorists, and she has no qualms saying it has no right to exist. She was joined by fellow CAIR chapter director and rabid Israel hater Hussam Ayloush, and American-Arab Anti-Discrimination Committee policy director Abed Ayoub, who said Omar "is speaking the truth." This came after Omar issued a statement "unequivocally" apologizing, but without ever specifically acknowledging her statements implying that Jewish money is the reason for U.S. support for Israel. "Anti-Semitism is real," she wrote, "and I am grateful for Jewish allies and colleagues who are educating me on the painful history of anti-Semitic tropes. My intention is never to offend my constituents or Jewish Americans as a whole." She never says she did anything hurtful. Minnesota's 5th Congressional District is skewed heavily in favor of Democratic voters. So Omar is unlikely to lose her seat anytime soon absent redistricting that makes it more competitive. Meanwhile, the Middle East Forum's Sam Westrop reports that Omar is set to speak Feb. 23 at a fundraiser for Islamic Relief USA. It is a part of Islamic Relief Worldwide, which allegedly has ties to the Egyptian Muslim Brotherhood. Israel and Bangladesh accuse the organization of helping finance radical groups. Omar will appear with Islamic Relief USA operations manager Yousef Abdallah, who the Middle East Forum found had expressed violently anti-Semitic ideas on his social-media accounts. One example Westrop cites indicates he and Omar may share similar ideas. Responding to then-New Jersey Gov. Chris Christie's 2014 apology for describing the "occupied" West Bank and Gaza, Abdallah wrote: "Christie kneels down on his knees before the Jewish lords and says 'I am sorry.' Only money makes stuff like this happen. Mr. Christie. Muslims should remember this very well." If her apology is sincere, Omar should reconsider appearing with Abdallah. And she should refund donations motivated by what her own party's leaders admit was clear anti-Semitism.